They call it the Blast. 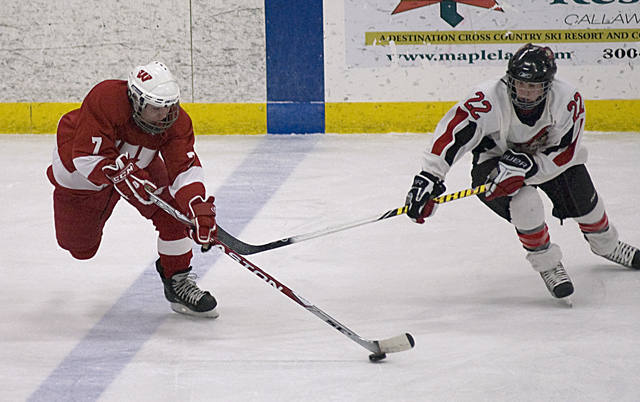 It’s designed to create a quick scoring chance off a face off. After Tuesday night, Grant Schow and Willmar might want to rename the play the Winner. Just 14 seconds into overtime of the Section 6A quarterfinals at No. 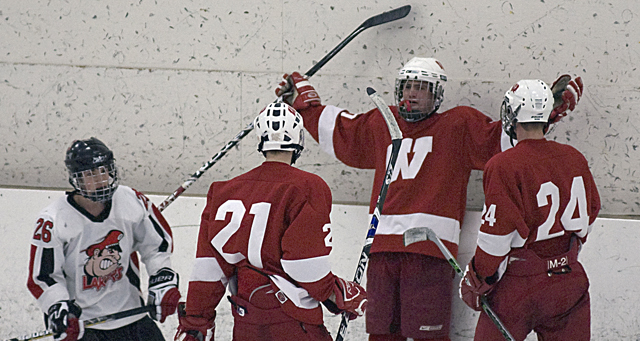 4 Detroit Lakes, Schow pounded home the game-winner off the Blast, sending No. 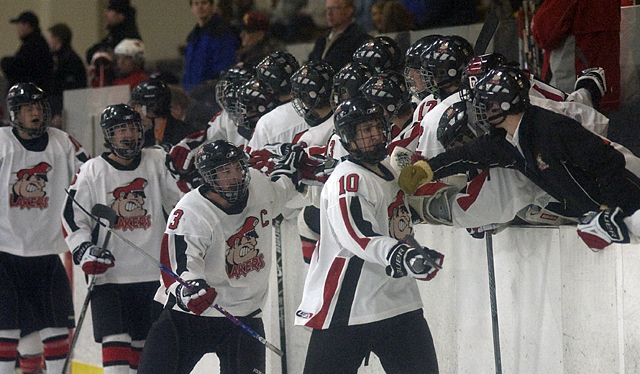 5 Willmar into a frenzy of celebration – and the section semifinals – by a 4-3 score. With a wide grin and his teammates shouting out victory in the background, the junior forward described the play in detail. 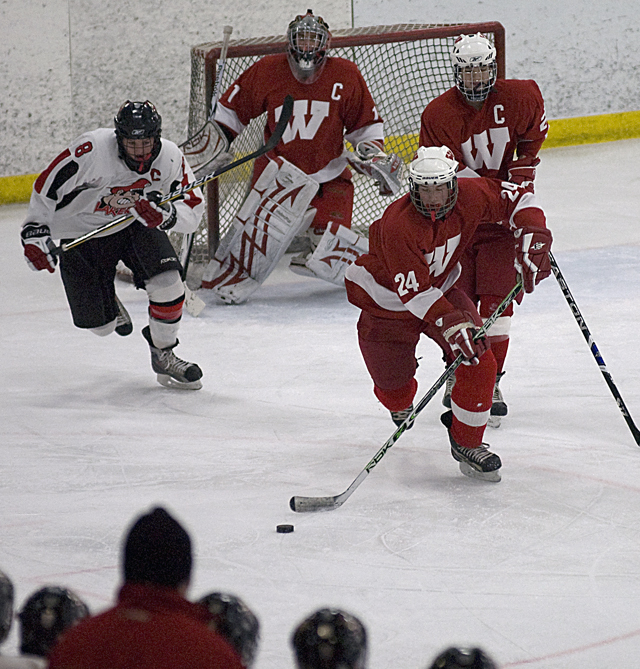 On the opening face off of overtime, coach Dan Tollefson sent both defensemen up to the wings, while leaving both wings on the blue line. 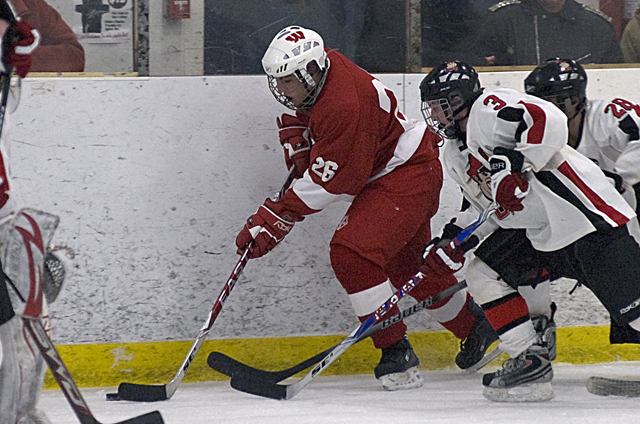 As soon as Willmar won the face off and dumped the puck into the Lakers’ end, the two wings streaked into the zone at full speed, while the defensemen dropped back, hopefully creating confusion. 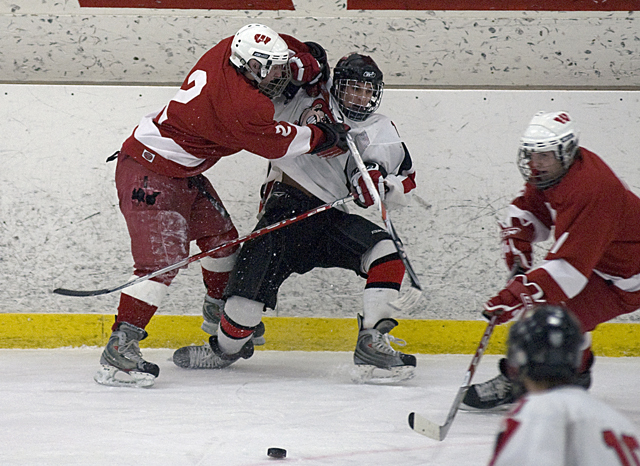 “It was kind of an aggressive play off the center face off and kind of caught them off guard,” Tollefson said. 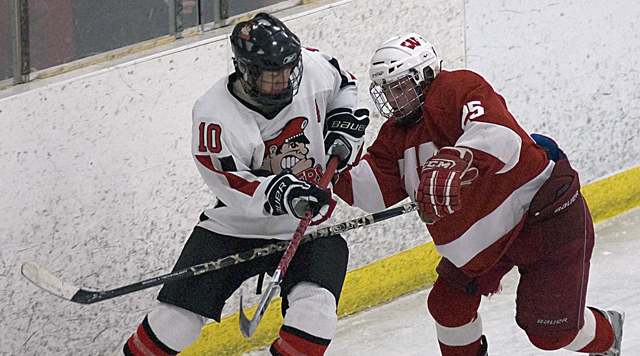 Willmar’s Gabe Amon reached the puck in the right corner first, fought off two defenders, and lifted a pass to Schow in the slot. It took just 14 seconds. 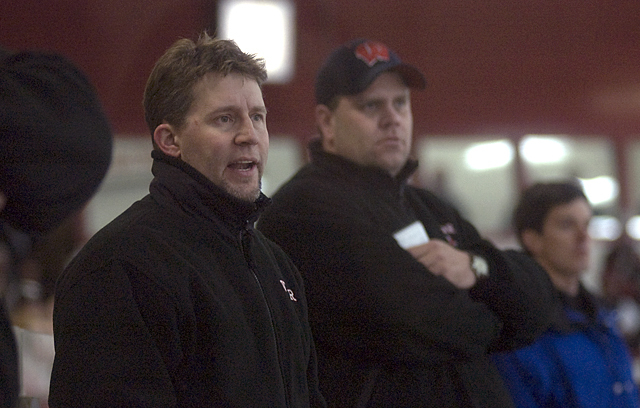 So quick was the goal, that Detroit Lakes coach Chris Denardo admitted he didn’t even see it. “I was looking down talking to someone and the next thing I knew, I looked up and the goal was in. The result was fitting for a game pitting the 4/5 seeds. No team opened up more than a single goal lead and for much of the game, it was tied. 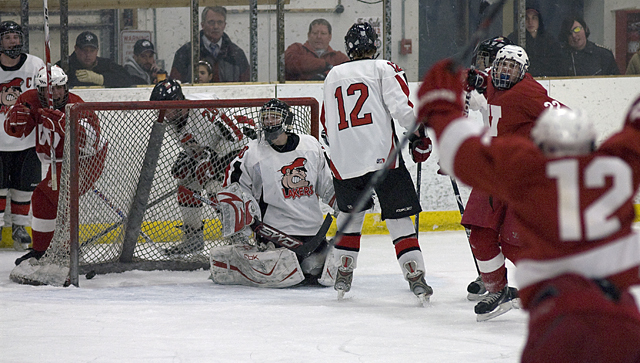 Willmar got on the board first, as Matt Eddy scored on a breakaway with just 40 seconds to go in the first period. 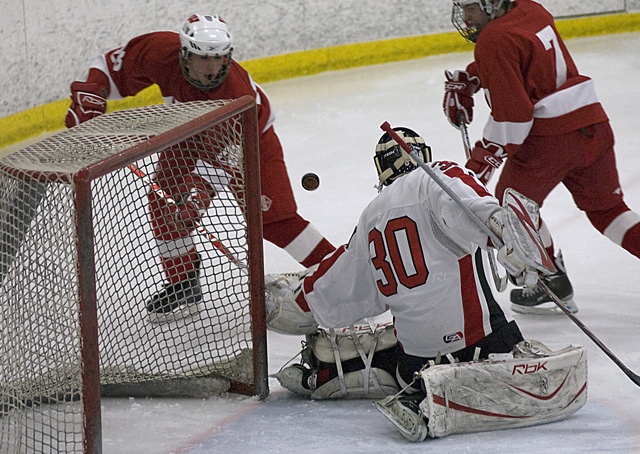 But Detroit Lakes’ Nate Baker responded with a bad-angle slap shot just 11 seconds later to tie it at 1-all. 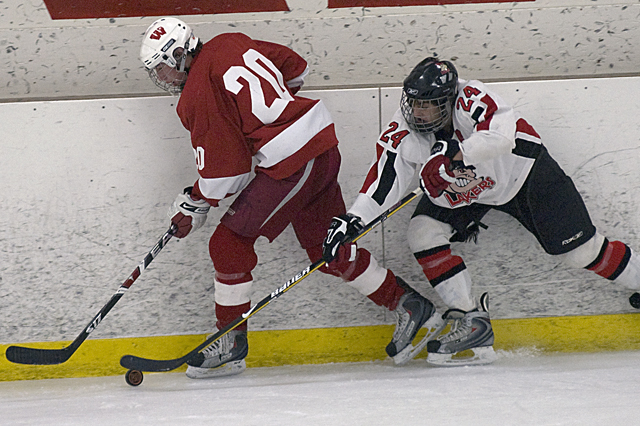 In the second period, Willmar again took a one-goal lead on Paul Schrupp’s power play shot from the point. But again, the Lakers’ rallied. Ryan Berg picked the corner from the high slot midway through the period to tie it at 2-all. 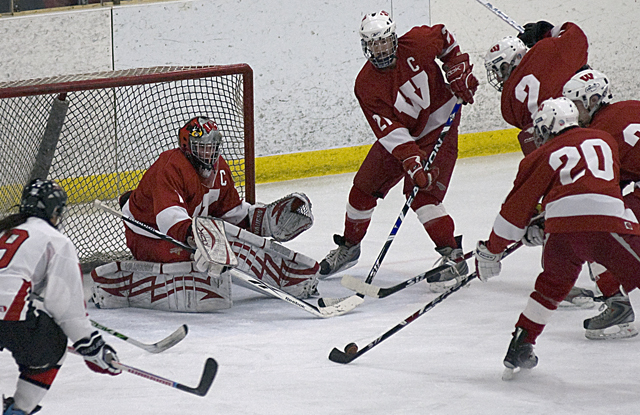 Detroit Lakes had several terrific chances to take the lead in the third period, twice hitting the crossbar in the opening two minutes. Star forward Tanner Lane, who came into the game with a state-leading 90 points, appeared to separate his right shoulder early in the third. He spent the rest of the game on the bench, holding it gingerly and unable to take the ice. Yet Detroit Lakes rallied in Lane’s absence, putting on plenty of pressure and taking their only lead of the game midway through the third. Baker notched his second goal of the game on the power play to gain a 3-2 lead for the Lakers. But they couldn’t hold off the Cardinals. Landon Peterson tied it just 2:20 later, sending the game to overtime. Both Schow and Tollefson said the Cardinals’ goal on the road was to keep the game close and win it in the end. They did just that. 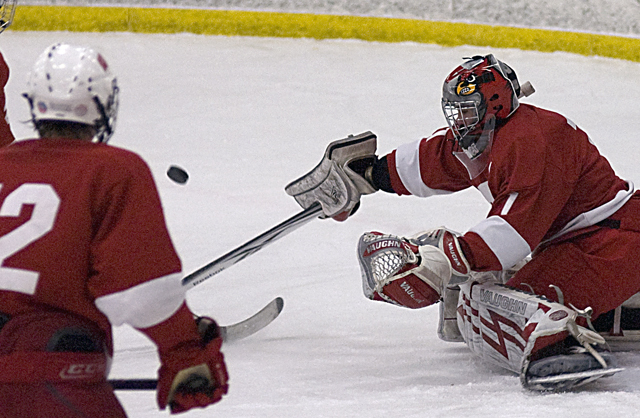 Willmar senior goaltender Ben Leitch was solid under intense pressure over the final two periods, stopping 37 of 40 shots. 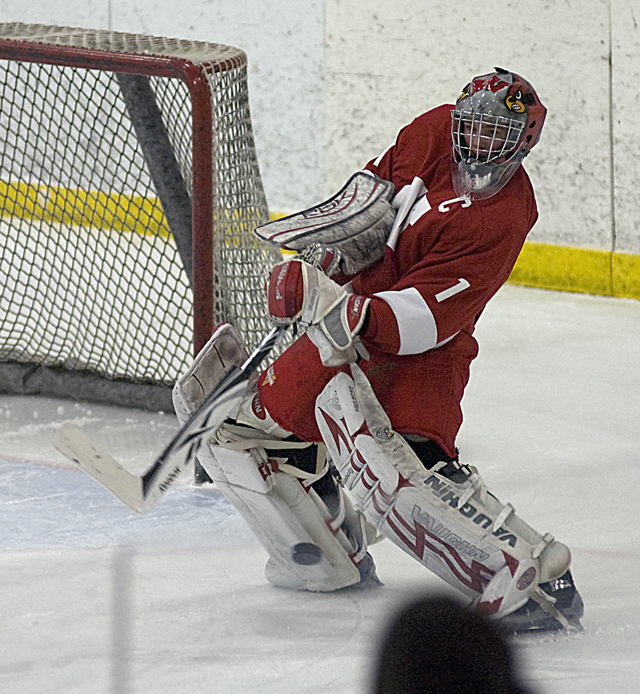 Andrew Friesen made 33 saves for Detroit Lakes. For Willmar, next comes a Section 6A semifinal match-up against No. 1 Alexandria this Saturday at the Runestone Community Center. 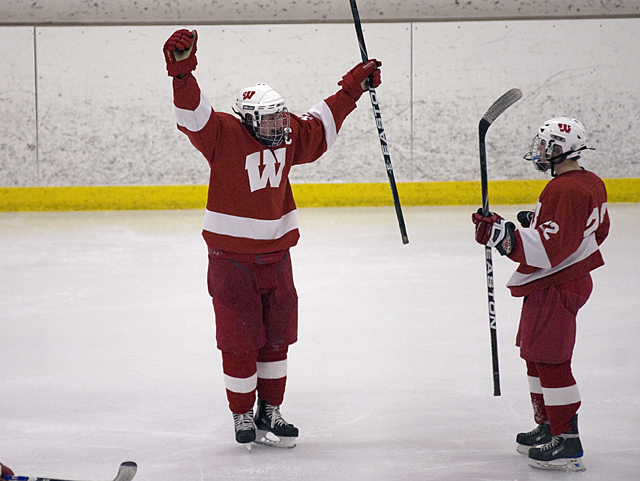 Willmar is the only section team to beat Alexandria this season, winning a 3-2 decision back on Dec. 15. Alexandria did claim the second regular season meeting, but Willmar has plenty of confidence entering the semifinals. Purchase game photos from the Breakdown! 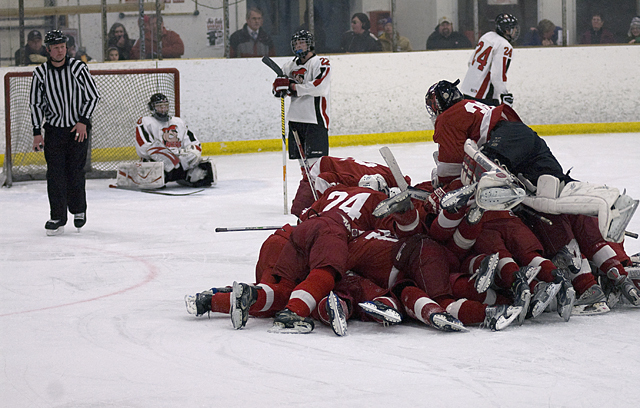 The junior forward set off the Cardinals' celebration, tallying the game-winning goal just 14 seconds into overtime. 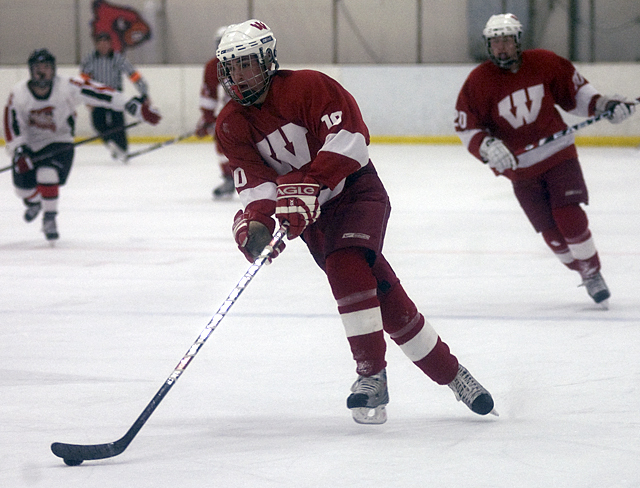 He also assisted on the first goal for Willmar, and showed great vision and speed on the ice. Just a junior, he'll be a huge factor in Willmar's possible playoff run. 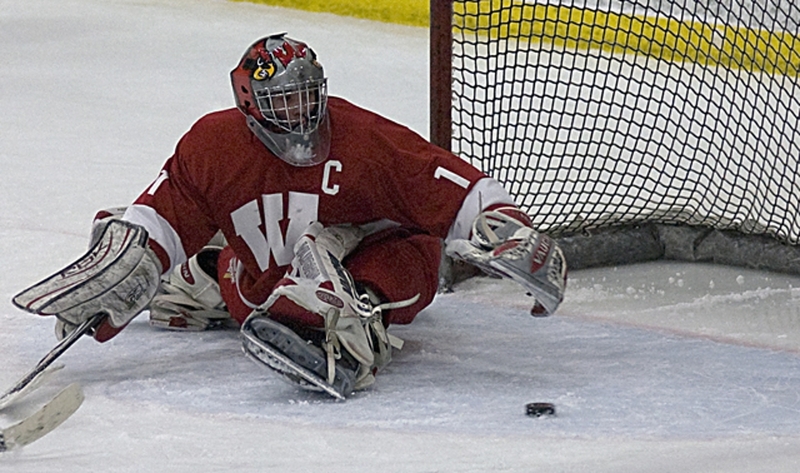 Willmar's senior goaltender didn't want his high school career to end quite yet, stopping 37 of 40 shots on the night. 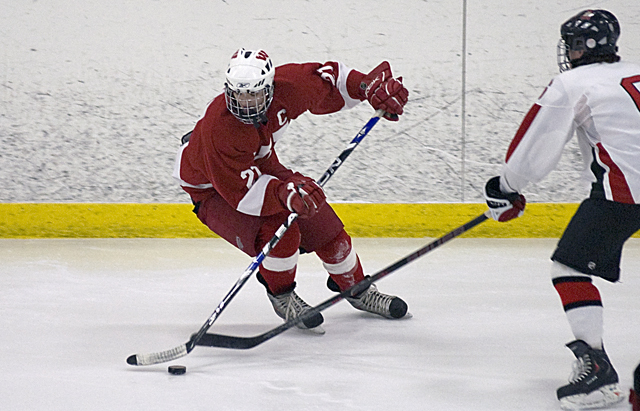 He was especially solid in the final two periods, making 29 stops, as Detroit Lakes ramped up its offense. With super scorer Tanner Lane sidelined with a shoulder dislocation, Baker stepped up with a pair of goals for the Lakers. 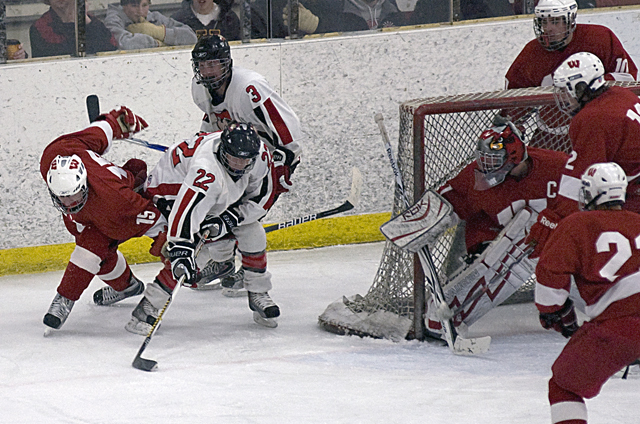 After Willmar took a 1-0 lead in the final minute of the first period, Baker scored 11 seconds later to tie it. He also netted a power play goal midway through the third that gave the Lakers' a brief 3-2 lead. Detroit Lakes fans showed their class after the game. While the Lakers' players crouched in disbelief after the game-winning overtime goal ended their season, the fans remained quietly standing in the bleachers. After a few minutes of silence, they showered their team with a standing ovation and a cheer of "Let's go Lakers!" With the victory, the fifth-seeded Willmar Cardinals advance to the Section 6A semifinals at No. 1 Alexandria, also named the Cardinals. Don't expect Willmar to be intimidated by the match-up, however. 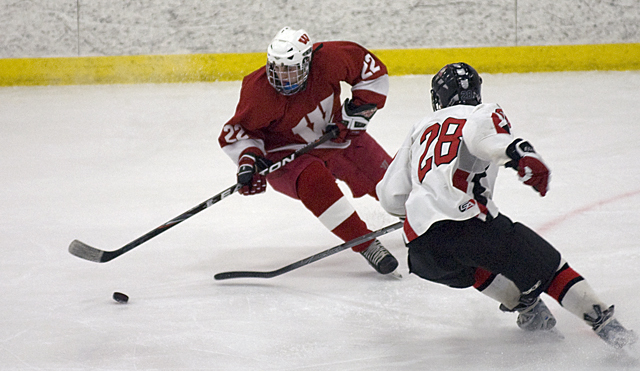 Willmar is the only section rival to beat Alexandria this season, as junior defenseman Landon Peterson tallied two goals in a 3-2 victory back on Dec. 15. 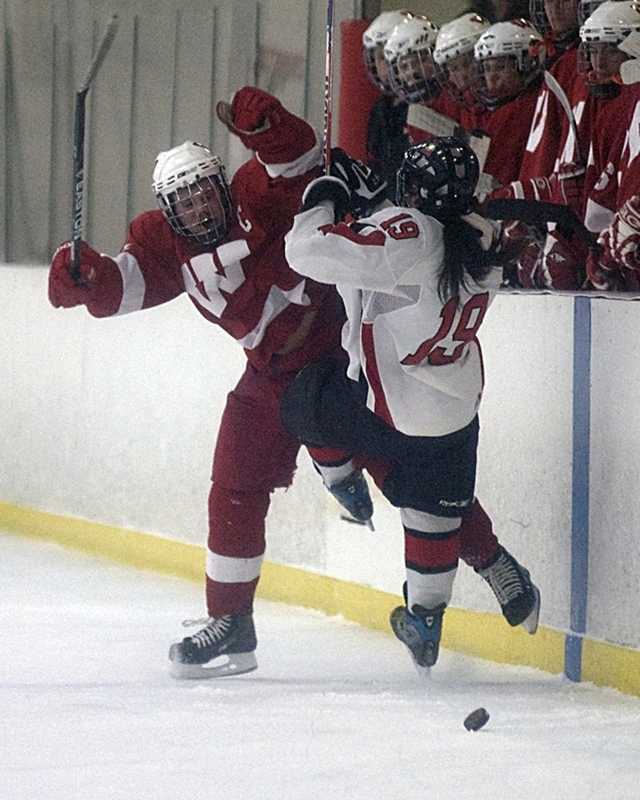 Alexandria did earn revenge in the rematch with a 5-2 win on Jan. 26. "We think we match up with them well. 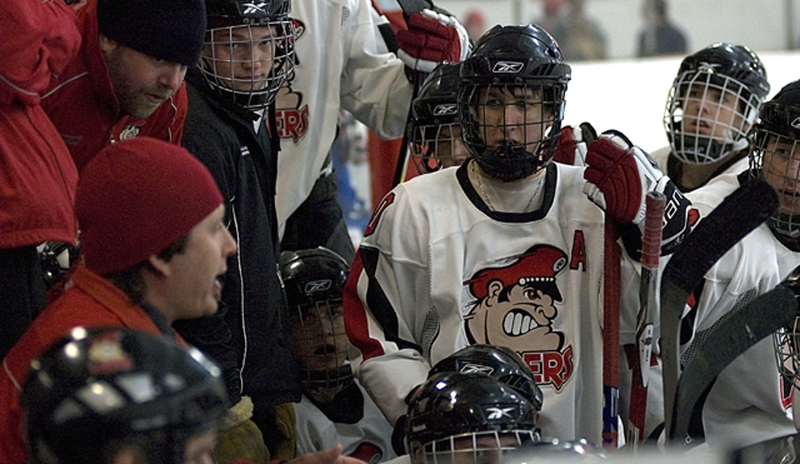 Line for line, we know what they do and they know what we do," coach Dan Tollefson said. Detroit Lakes junior sniper Tanner Lane watched much of the third period and the overtime from the Lakers' bench with what was thought to be a separated right shoulder. Lane was injured on a seemingly innocent check early in the third, but was unable to continue. His absence was certainly felt, as he tied for the state scoring lead with St. Francis' Joey Benik, each with 90 regular season points. 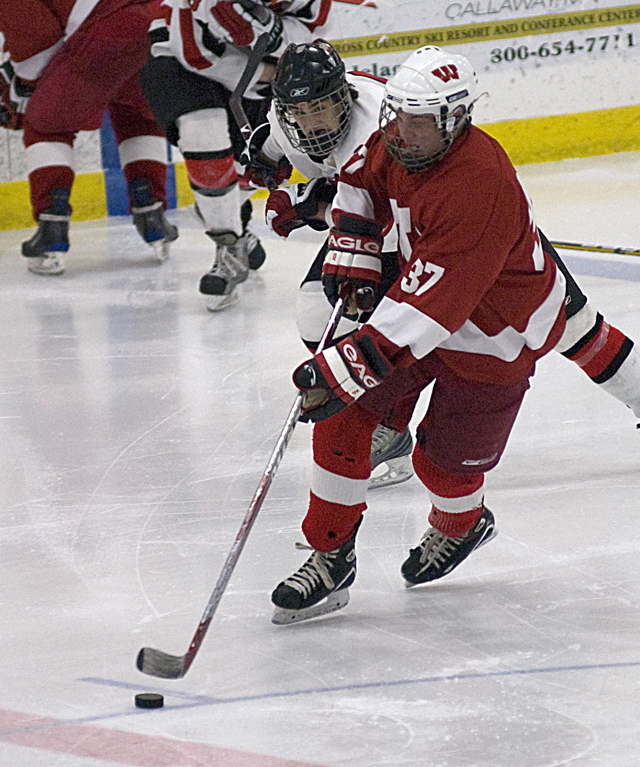 In the Lakers' 4-2 regular season victory at Willmar, he had a goal and two assists. "He's their key player and their whole team (feeds) off of him. He's their rock," Willmar's Grant Schow said.